The GE Foundation sponsors a healthcare education program for universities in the Tohoku region, which were impacted by the disasters of March 11, 2011. This includes university courses to develop the next generation of health information specialists, as well as a series of seminars targeted towards existing practitioners, care providers and local governments in order to promote regional health collaboration. Over the course of 2012 and 2013, TOMODACHI sponsored the Miyagi Perinatal Support Program, run by Dr. Sugawara of Tohoku University Hospital. The program aims to achieve a global maternal and child support system in the tsunami-affected region in Miyagi Prefecture through U.S.-Japan collaboration.” Dr. Sugawara was deeply concerned by the lack of a long-term support system for infants and expectant mothers, and thus he created this program to address this problem. In late 2012 and over the course of 2013, Dr. Sugawara organized several counselling sessions for mothers and infants, giving them the opportunity to meet medical professionals. Two sessions took place in Onagawa, in December 2012 and March 2013, and two more sessions took place in Minamisanriku, in September and November 2013. The group sizes were small (20 people total from both cities) which ensured that the meetings more intimate and allowed for better interactions between the mothers and the obstetric specialists. Onagawa and MinamiSanriku were two towns that were hit particularly badly by the tsunami, and as there were no official obstetric services available in the region before, feedback from the participants was very positive. One of Dr. Sugawara’s ongoing projects is the collection of perinatal data in Miyagi Prefecture. Data on infants and expectant mothers had already been collected from obstetric facilities nationwide, including those in Tsunami-affected regions, but Dr. Sugawara and his staff went further, obtaining data on refugees from over 300 shelters in Ishinomaki City. He now hopes to be able to consolidate and analyse this data, as he plans to conduct a detailed study of the perinatal data. This will enable him to assess maternal health treatment needs in disaster situations in order to identify specific needs for developing better long-term support in the region and to be better prepared for future natural disasters. Between September 2012 and and August 2013, Dr. Sugawara conducted several 2-day ALSO and BLSO courses in Ishinomaki and Kesennuma. These courses are designed to train medical professionals to manage any potential emergencies that may arise during the perinatal period, particularly in the aftermath of a natural disaster. A total of 76 people participated in these courses, where they were given hands-on training using life-sized mannequins in how to deliver a baby, how to resuscitate an infant, and what to do in the event the mother loses a substantial amount of blood. Dr. Sugawara felt that these courses were especially important, especially because the Tohoku region does not have many physicians, let alone obstetrics specialists, and is prone to natural disasters. 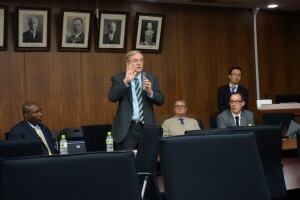 In April 2013, Dr. Sugawara invited three prominent experts from the U.S. for a US-Japan Seminar and Study Tour to tsunami-affected towns. These experts spoke on a range of topics relating to disaster preparedness: Dr. Cham E. Dallas from the College of Public Health spoke about “Disaster Management Plans and Preparedness for Hospitals and health facilities,” Dr. Daniel Fagbuyi from the Children’s National Medical Center spoke about “Disaster and Preparedness plans of Children and Mothers during disasters,” and Dr. David Eisenman from UCLA spoke about “Community Disaster Resilience and the Mental Health surge.” The experts who gave the seminars all mentioned how the tour had been an incredibly eye-opening experience, while the local people attending their seminars all found the talks to be very informative, as speakers and listeners alike felt that they learned a great deal from each other. Study Tour to the U.S. In 2013, Dr. Sugawara and a group from the Tohoku University Hospital visited Washington, D.C. to study disaster preparedness and disaster management. On the trip, discussions were held with Dr. Kenneth Schor from the National Center for Disaster Medicine and Public Health (NCDMPH), Dr. James J. James from the Society for Disaster Medicine and Public Health, and Dr. Charles W. Beadling from the Uniformed Sciences University of the Health Sciences (USUHS), as well as various other doctors from the Children’s National Medical Center. Dr. Sugawara reported that this trip was extremely productive as they were able to establish a strong relationship with the respective institutions, and were therefore able to exchange a great deal of ideas. Dr. Sugawara plans to continue his work for the Miyagi Perinatal Support Program through 2014,and is hoping to support an international symposium in Washington, D.C in May,, where experts in the fields of disaster medicine and public health will put forward their ideas and recommendations to improve disaster preparedness and response in regions affected by natural disaster. Dr. Sugawara would also like to organize further ALSO and BLSO education courses and counselling sessions in towns affected by the tsunami, continuing in the same vein as he has thus far.